A new book, Photograph, of never-before-seen photographs, is due to be released this month. DRUMMER RINGO STARR especially loved taking photos. During the group’s glory days, Starr was active behind the lens, capturing candid moments on tour, backstage, and in the studio. His work has been catalogued in a new book, “Photograph,” which contains over 250 extremely rare and never-before-seen photographs taken by the world-famous drummer. Published by Genesis Publications, the book will go on sale September 21. “There’s a lot of pictures in this book, shots of ‘the boys’ that only I could have taken,” says Starr in the introduction. Take a peek at the highlights below, as well as some of Starr’s musings from the book. This image was taken before Starr joined The Beatles, when he was still playing drums for a band called Rory Storm and the Hurricanes. Soon after that photo was taken, Starr joined The Beatles. As the band’s popularity grew, their days became busy with making music, going to photo shoots, and touring. Here, the band is pictured on a train car between New York City and Washington, DC. Starr says he feels bad for famous young musicians of this generation who can’t escape the media and society completely. “We’d go on holiday and it was great; we could go away, have a good time, and be left alone,” he says. McCartney and John Lennon (pictured) wrote the majority of The Beatles’ early songs. “John and Paul would write the songs at the beginning, then George [Harrison] started, and then I joined in, too late I may add,” says Starr. Here’s Harrison being goofy in the studio. Starr claims he was “lucky” to take these shots, but moments such as this — of McCartney and Lennon recording vocals — show his talented and special eye for photography. Lennon, captured in one of his classic poses. “He had this weird way of sitting. The knee could go down to the floor and the leg right up to his shoulder! John and his fabulous loose hips,” says Starr. This image of Starr and McCartney was taken with a timer, which Starr notes felt strange because the two were never sure when exactly it would go off. Starr especially enjoyed taking photos of the paparazzi. Photographer Dežo Hoffman, bottom left, shot The Beatles often. 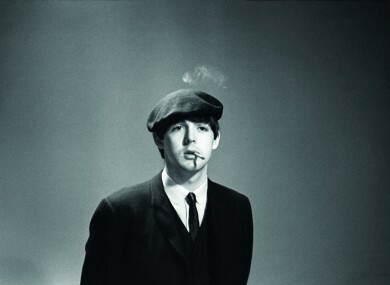 McCartney reportedly declared Hoffman the best photographer in the world. Starr also enjoyed snapping pics of fans from the car. “The first couple of years, we saw a lot of places from the car because we couldn’t go out anywhere. We were just so big time. Everybody wanted a piece of us, so getting out was a big day,” he says. Here, Harrison is caught cleaning up. “He never took his shirt off while washing his hands and face — very Liverpool!” says Starr. All of the group’s members had cameras — here’s McCartney holding his 35mm. This was shot from behind the scenes of “A Hard Day’s Night,” the band’s feature-film debut. In the flick, Starr can be spotted walking with a camera around his neck and taking pictures. When gathering images for “Photograph,” Starr was pleasantly surprised to find many more than he remembered taking. Finding all the pictures for the book wasn’t easy. Because he never kept a true archive, Starr’s photographs were spread across three different countries. The research for the photos began online, where a few were found. Then Starr received some from a fan in San Diego who had collected things from Starr’s earlier band. “It was just incredible, the amount of material I’ve found, which is now safe,” Starr says in the book’s introduction. “Photograph,” the official book by Ringo Starr, will be released in September 2015 by Genesis Publications. It goes on sale on September 21 at major bookstores and RingoPhotoBook.com. Email “Photos taken by Ringo Starr show how The Beatles liked to chill behind the scenes”. Feedback on “Photos taken by Ringo Starr show how The Beatles liked to chill behind the scenes”.